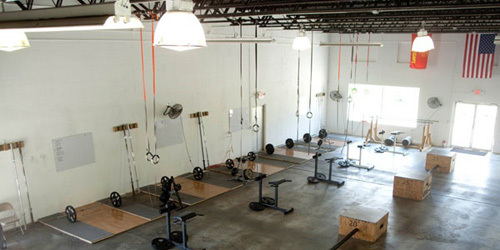 I just recently started working out~training at Bradenton Fit Crew! For me~here is what it is all about~ doing things you never thought of doing or you never thought were possible. Each one of us has the power within to do WHATEVER we desire, and it all depends on how bad you want it. 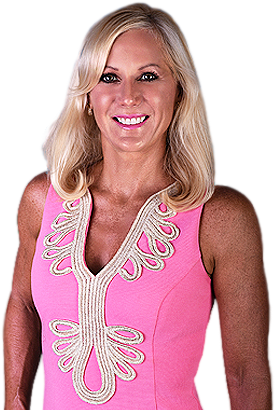 When I did my first Marathon in Sarasota 2008 I had never run any farther than 13 miles and decided to go out and just “do it”… run a Marathon without training…. yeah I know that sounds crazy and I could have really gotten injured however I was running at least 40-50 miles per week just not 26.2 miles at one time so I know in my brain it could be done…. I was mentally prepared. Same thing with my first Triathlon… the swimming part horrified me (sharks, getting kicked in the head, jelly fish etc.) but I when I went into an uncomfortable zone and conquered that goal I came out stronger in the end. I can’t be fixated on the things I am not able to do yet (pull ups~heavier weights~ faster times) so I get excited about the things that I am already doing! That in return opens my inner strength to the things I am pushing hard to conquer! I ask myself how bad do I want it??? 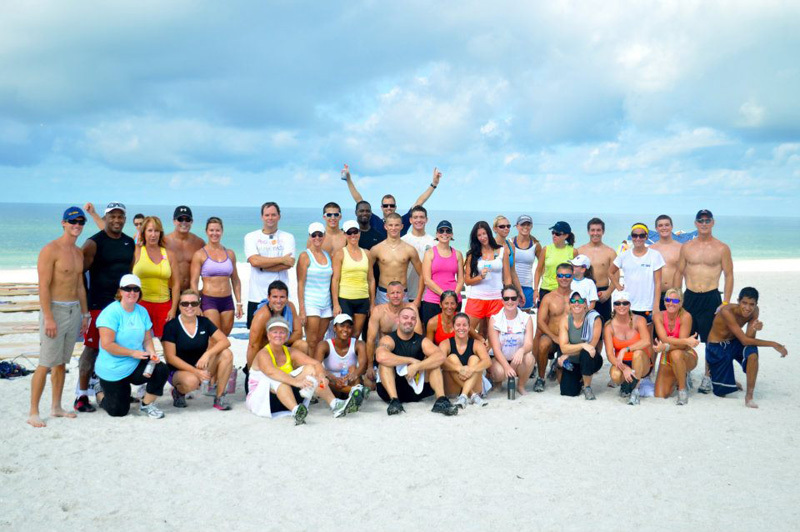 Fit Crew Anna Maria Island Challenge 2011. 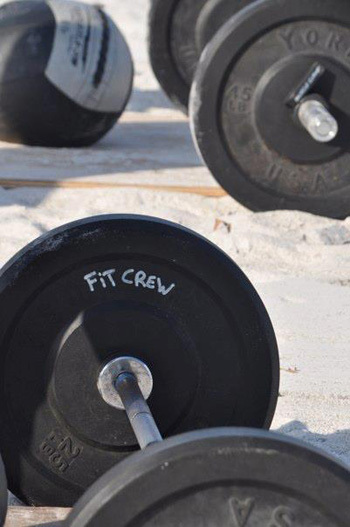 Fit Crew is similar to Cross Fit. 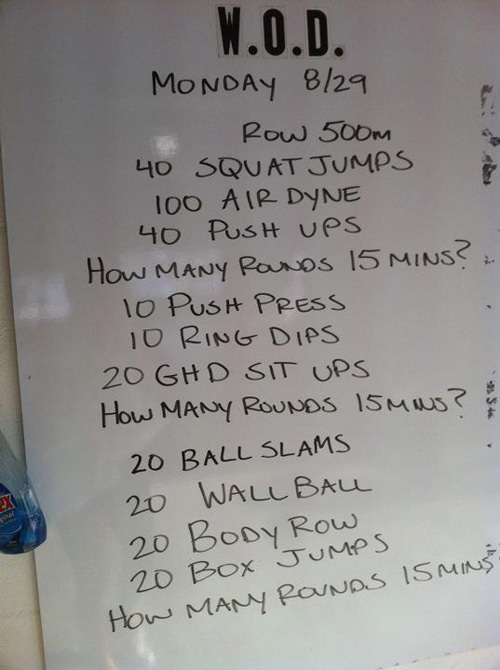 CrossFit is the principal strength and conditioning program for many police academies and tactical operations teams, military special operations units, champion martial artists, and hundreds of other elite and professional athletes worldwide. The strengthening and conditioning system is built on constantly varied random and functional movements executed at high intensity. 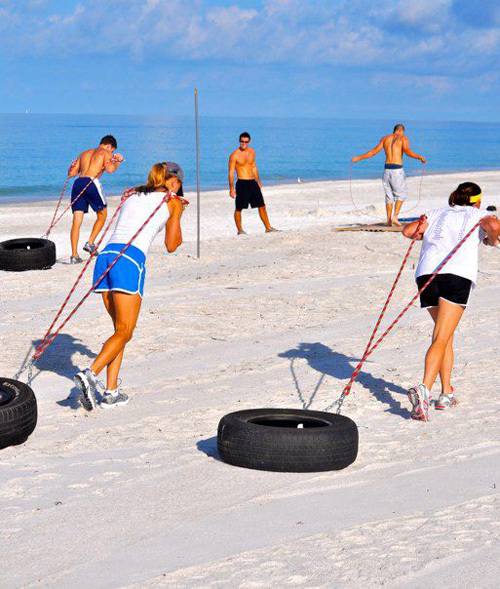 At Bradenton Fit Crew we utilize rowing machines, free weights, focus on core dominant exercises with the Ghd machine; sit ups, pull-ups, tractor tire pulls, rope climbing, ring dips, push press, aerodyne machines, jump ropes, burpees, push ups and running suicides and a whole hell of ALOT more!!! Everyday there is a different work out posted on the wall when you enter the gym~ and believe it or not one routine will ever be the same. I guess that is why I like it so much…..because of the anticipation of looking at the WOD (workout of the day) and mentally preparing myself to succeed the expectations posted for the day! After all the years of running 5k, 10k, half and full Marathons, triathlons and road cycling this is a great change up to my workouts! Fit Crew is not pretentious.. you just park your attitude and excuses at the door and bring in a willingness to learn~train and have FUN! NO mirrors (thank God) lol… and believe it or not I am surrounded by athletes, lawyers, grandmas, military and business men, housewives, law enforcement etc… a mix that makes it fun and everyone is here to encourage and challenge one another! September 24, 2011 at 9:00 am. 20 Squats, 100 Rope slams, 200 yard Tire Drag, 30 burpees, 200 jump rope, 30 kettle ball swings, 60 sit ups, 200 yard farmer walk/45 lb weights, and 10 pull ups. Come out and take the Fit Crew challenge I promise you will come back for more! 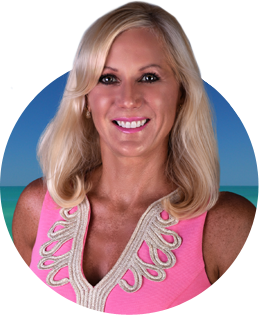 For information on Anna Maria Island Homes for sale or things to do on Anna Maria Island please contact me, Cindy Quinn at [email protected] or 941-780-8000.